The ESA's new dropship is designed to target areas safe for landing and lower rovers onto the surface of Mars. 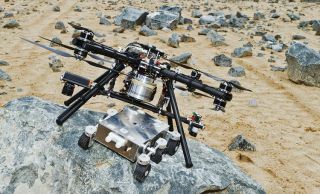 An autonomous quadcopter could be landing space rovers on the Martian surface in future explorations of the Red Planet. The European Space Agency's (ESA) "dropship" quadcopter steers itself, and can identify suitable areas to safely lower and land a rover onto the rocky surface of Mars. The so-called "Dropter" project is the latest development from ESA's StarTiger initiative, a program designed to bring together researchers from different fields to focus on one space exploration project at a time. ESA officials unveiled a video of the Dropter concept for Mars rovers this month. NASA, for example, used a huge "sky crane" to land the 1-ton Curiosity rover when it arrived on Mars in August 2012. After a parachute slowed Curiosity's descent, this autonomous structure took over. With rocket-powered thrusters to guide the landing, the sky crane lowered Curiosity down to the planet with cables. Then it cut the cords and flew safely off to the side for an intentional crash landing. ESA has come up with a different approach. The Dropter team built the dropship lander to model a quadcopter — a helicopter with two propellers and four rotors. It uses GPS and inertia control to find its way to a predetermined suitable deployment zone. The dropship then switches to a vision-based navigation system, using lasers and barometers that can determine the safest spot to lower the rover down to the surface. The Dropter dropship can reach a maximum height of 56 feet (17 meters), and once it identifies a safe spot, it descends to 33 feet (10 m) above the surface. Then the dropship lowers its precious cargo to the ground using a 16-foot (5 m) cable. The team put the dropship through test flights in a 131-by-131-foot (40 by 40 m) model of the Mars landscape built at the Airbus Trauen site in Germany. For the tests, the dropship had to weave its way over huge rock patches and determine a safe landing spot to deliver the rover. The tests were successful, but the dropship is not ready for space yet. Researchers still need to test how it will perform carrying heavier, more realistic-size rovers, and figure out how the Martian atmosphere will influence the dropship's flying ability.